The 2017-18 Whitaker Ideas Forum series begins on 13 September and takes place weekly on Wednesdays from 1:00pm – 2:00pm through 22nd November. 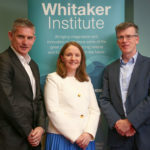 The Whitaker Ideas Forum seminars have, to-date, showcased the diverse range of research being conducted across the Institute. The forum represents a great opportunity for early career researchers to present to their peers and research cluster colleagues. All presentations have stimulated engaging discussions and, in some instances, introduced new intra-Institute collaborative opportunities for Institute members. The seminar series takes place in the Whitaker Institute Seminar Room (CA110) in the Cairnes Building. The seminar series is a brown bag-style event, with tea/coffee provided for attendees.